The Annual Salute to Freedom Gala, honors six outstanding service members stationed or deployed from North Carolina, as well as two outstanding North Carolina Community Members. Each of the honorees will receive a Can Cooler with their name listed on it, along with the USO's logo. “We are so pleased to be able to support the USO on a regular basis by providing Can Coolers for special ocassions. The USO is such an integral part of supporting military servicemen and women, and we are proud to be a part of it,” said Julie Liddle, owner of Kustom Koozies. Kustom Koozies is one of the foremost internet providers of insulated beverage containers. These are used for a number of different occasions. Can coolers are used as party favors and are particularly popular for weddings, birthday parties, class and family reunions and are used quite often by businesses as a give away item. Kustom Koozies provides 20 different styles to choose from. The two main categories are collapsible and foam. Collapsible can coolers are foldable and are primarily used for mailings, or easy transport. Foam can coolers are the best insulators and are sturdy and stackable. Kustom Koozies provides 100's of free great designs for parties and events. Some of their most popular are “to have and to hold and to keep your drink cold” and “the vows are done, let's have some fun." Customers are also able to upload their own graphics. If you are not sure what these can coolers are called, Remember, it’s not koosie, koosies, koosey, kooseys, cozy, coozys, coozey, coozeys, coozie, cozies, coosy, coosys, coosie, coosies, coozey, coozeys, cozy, cozys, cozie or cozies … it’s a KOOZIE®. Kustom Koozies was founded in 1999 in the spare bedroom of the owners house. 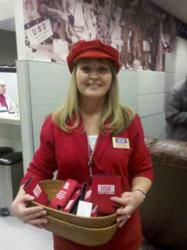 Kustom Koozies services over 6,000 customers annually. Kustom Koozies can be found http://www.kustomkoozies.com or email us at mailto:nancy(at)kustomkoozies(dot)comor “Like” us on facebook!